Since 2015, Mr. Alexander McCune has been Music Director for FVAD’s Musical Theatre School, and Choir Master for our Children’s Choirs. Mr. Alexander McCune has spent his life in learning, studying and training for choral and solo singing. With more than a decade of experience training young voices, he is passionate about the importance of singing for children and young adults. Proper technique will give a young singer a strong, natural sound and keep their voice healthy for life. Mr. McCune believes strongly in the importance of musical literacy and trains all his students in reading notes and musical symbols, so that they can create and read music for themselves. With a singing background that includes classical, sacred, opera, vocal jazz and a capella groups as well as musical theatre, Mr. McCune has the knowledge and the passion to help young performers become skilled artists, comfortable on the stage! Alexander McCune has spent his life immersed in music. A native of Edmonton, he has played the piano since childhood and is an accomplished accompanist, playing or improvising in many styles on the piano or pipe organ. Choral singing began at age six. Following over a decade of training and performance in various excellent choirs, Mr. McCune performed on CBC, and toured to Germany, England and Wales with the award-winning Edmonton Youth Choir under the direction of Dr. John Wiebe. After a childhood and education filled with voice and piano lessons and choral singing and touring, Mr. McCune studied Jazz and Contemporary Piano at Grant McEwan College in Edmonton, then continued his post-secondary studies at Our Lady Seat of Wisdom Academy (OLSWA) in Barry’s Bay, Ontario. There, he became Program Assistant in their Sacred Choral Program. In 2010, Mr. McCune became an instructor in Ottawa’s Sparrows Choir School, reaching over 2,500 children in Ottawa with sacred and classical choir training every week. In 2014, Mr. McCune moved with his wife to BC to complete his BA in Music at Trinity Western University. In that year, he also took the position of choir master for the Bakerview Music Academy, an El Sistema academy offering music lessons for underprivileged children. 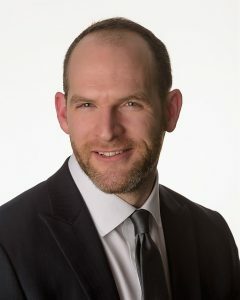 Mr. McCune is now the Program Director and Choir Director for the Bakerview Music Academy, and directs the Gloria Dei Chorale in New Westminster. He keeps a small studio for voice and piano in the Fraser Valley, and directs several concert or training projects each year. This summer, Mr. McCune was proud to be involved in the teaching and planning for the first BC Sacred Music Symposium, held in Aldergrove.